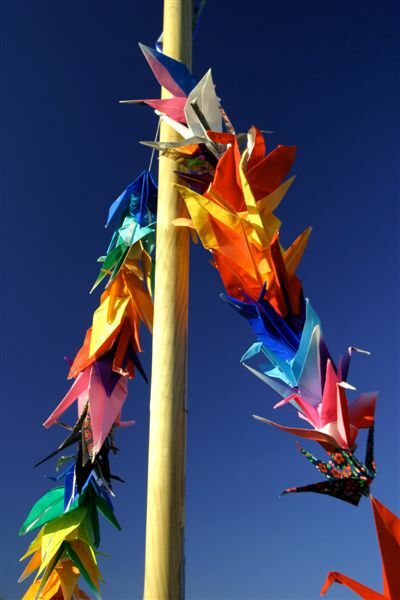 Satruday, August 6, marked the 60th anniversary of the atomic bombing of Hiroshima, Japan by the United States. 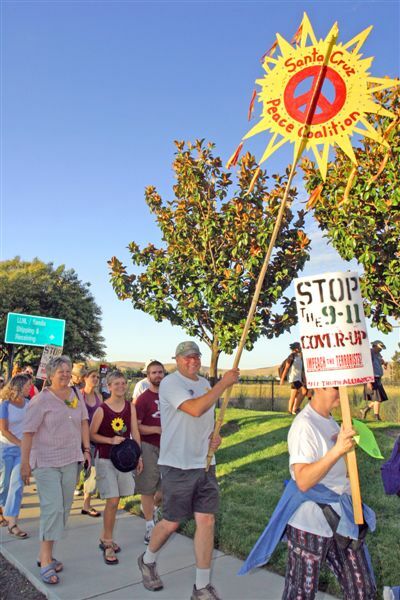 Hundreds of anti-nuclear protesters marched to the gates of Lawrence Livermore Laboratories, one of the primary sites for the continued research and development of new and "improved" thermonuclear weapons. 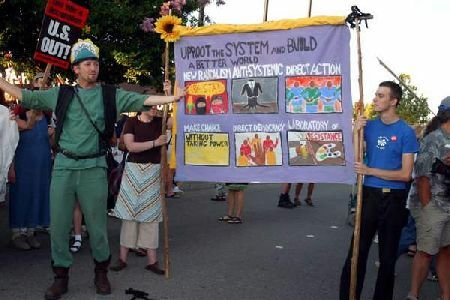 Members of the Santa Cruz Peace Coalition march towards the Lab gates. These pictures are beautiful, man. 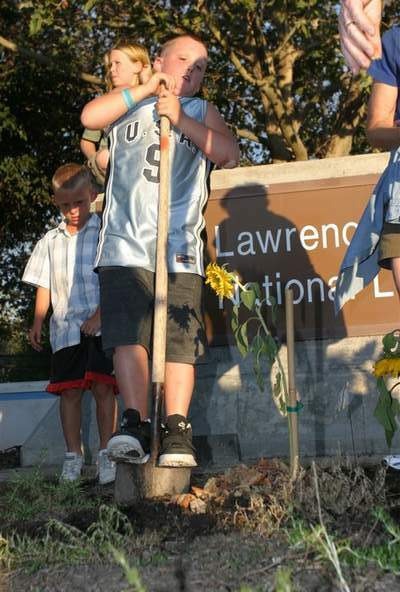 I am especially inspired by the children planting sunflowers. Children, our future, are the reason why I work for peace and the abolition of Nukes. Thank you for sharing your pictures. yes, the flowers are all very pretty. to effect what's going on at livermore. 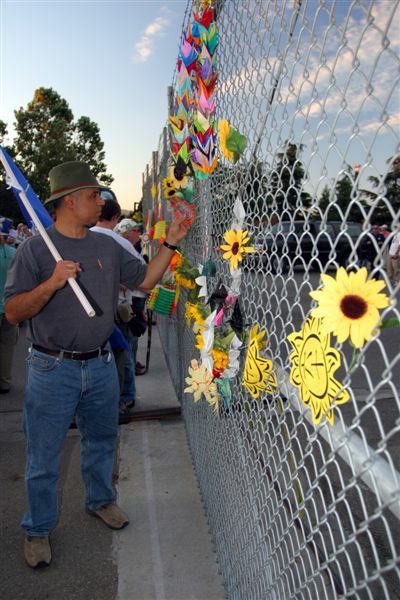 putting sunflowers on the gates outside isn't going to stop the people inside from doing their research and development. i mean, aren't protests like this alittle silly. save for the fact that it gives the children something to do (plant flowers) looks like it was a bit useless to me. understandably said realist. 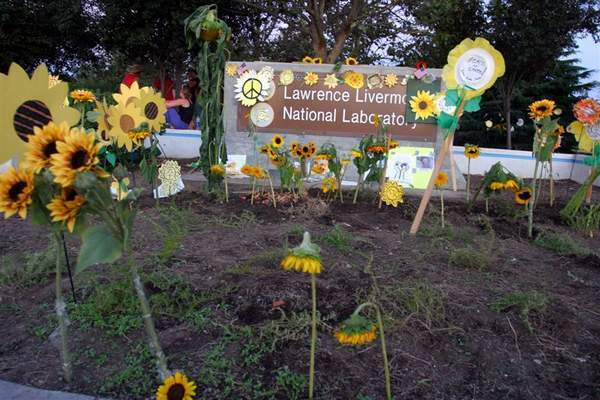 just so you know, the organizers of this event have been doing this event consecutively every year with the purpose of speaking to the people/community of Livermore, not necessarily to the lab employees or funders. most lab employees are not even there these days. 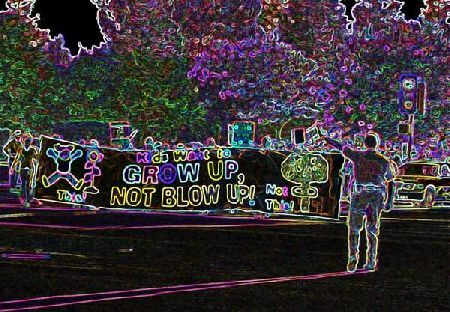 the point is not so much to protest as to educate and remind people in the Livermore community (visually, verbally, and artistically) about Hiroshima and Nagasaki and the realities of what are being produced at the lab. This event's focus is education and rememberance (resistance too), not so much as a protest. also, do you know about tuesdays direct action (54 people arrested at the LL gates on a working day)? 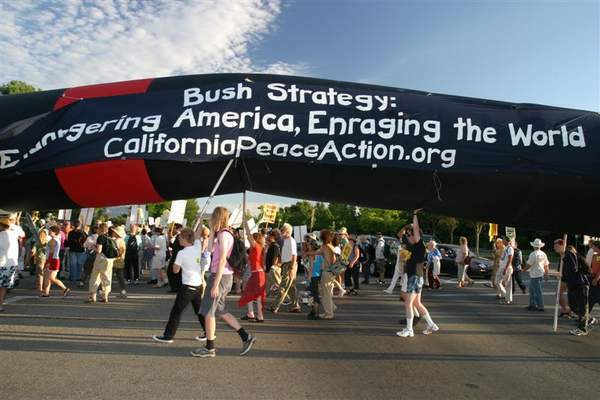 This action, complete with civil disobedience, served more as a direct and visible protest. I will say, since i'm assuming you weren't, there it was not a useless event. every event like this (with lots of participating organizations) is a great networking and solidarity building opportunity (which this event was for those of us that attended). i understand the source of your criticism and am constantly evaluating, for myself, what i believe to be effective, for myself and my community. the answers are differnt for everyone and constantly subject to re-evaluation. it's a good point in general about tactic and the diversity of opinion about what is affective, impactful, etc. I will ask you, as i ask myself when I criticize someones tactics or efforts, what do you suggest??? it's not too fair to criticize without some constructive ideas for addressing the issue you criticize. what are you willing to do????? 1. The powers that be at Lawerence Livermore are/were reminded that their actions continue to be scrutinized and criticized by the public. This includes criticism of unknown nuclear development as well as specific outcry at the past use of nuclear weapons and their ongoing use (depleted uranium). Just as is represented by letters sent to legislators, for every one of the hundreds demonstrating at Livermore, there are many more at home who are ashamed and outraged by the actions at the Lab. 2. The Bay Area media audience (those who read the papers from Santa Cruz, San Jose or San Francisco, or watched the TV news) were reminded about the significance of August 6 -- the bombing of Hiroshima -- and its correlation to continued nuclear development. Media watchers and readers were reminded of the massacre of civilians which occured 60 years ago as well as the use of depleted uranium which is destroying the lives and environment of those far away and those returning home from far away. Rather than continue in our blissful ignornant stasis (oh, the war continues but there's not much harm in it), many people exposed to this reminder may have been sparked to consider the toll of war, the toll of nuclear weapons and the devastation our country imparts on civilian communities in the name of peace and democracy. 3. Those present at the event, educated themselves, took part in a community of resistance, and raised their voices against something they fundamentally reject. What was "realist" doing on August 6? The children present weren't just given something to do. 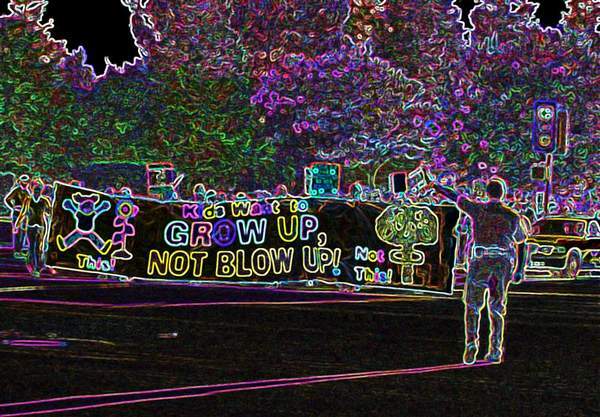 The children and adults opened their minds to the idea that nuclear development is neither inevitable nor just. These are children and adults who return to their respective communities to dialogue about the dangers and horrors of nuclear weapons. I, for one, returned to work on Monday and told people what I did that weekend. Instead of a discussion of current movies, my workplace had a discussion of nuclear development. When I called relatives and discussed my activities, the same occured. Engaging our acquaintances and loved ones in meaningful discussion about war, destruction, weapons and energy sources is a means by which our communities educate themselves. I hope "Realist" discusses this action at her/his workplace and with her/his family. Dismantling weapons may be the ultimate goal but education and awareness are important steps on that road. Most people I was in contact with in the weeks leading up to August 6 had no idea the anniversary was nearing. Many people are unaware about the continued use of and effects of depleted uranium. When the mass media draws attention to Iran and its continued nuclear development, it's essential that readers and watchers realize there is a bigger nuclear discussion/debate/outcry going on. Couch quarterbacks who read about the August 6 and 9 actions, may not cause Livermore to grind to a halt. 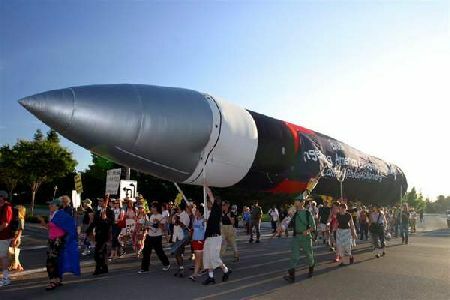 But at least they, the participants, passersby, neighbors, Lab workers, gave some thought to nuclear proliferation. Thank you for taking the time and thought to consider the effects of protest against nuclear development. I believe that the protest had many long lasting effects. I agree that some things could take place in a different (more engaged, less passive) manner. I encourage "Realist" to offer ideas about increasing the effectiveness of future actions. Maybe we'll meet next year as the event is in the planning stages. My thoughts for improving the action: more theater, puppets, music, discussion and other efforts to engage participants and create beauty to draw attention to the issue. For instance: a peace-dove as wide as a building which would be huge, beautiful and held above protesters to shield them from the sun. A variation, if the walk were to continue on the sidewalk, would be a peace-dragon which could dance down the sidewalk while shielding walkers. Santa Cruz participants might consider joining their efforts in a more concerted, larger effort next year.